Choeng Mon beach has a diverse topography. Its northern part is mostly wide stripe of fine white sand, so the southern part is divided into several rocky coves, which are not suitable for swimming, but tantalizingly beautiful and romantic. Choeng-Mon is located in the same name bay. It is a quiet place, extremely good for family vacation. The total length of the beach is small: about 1,3 miles. 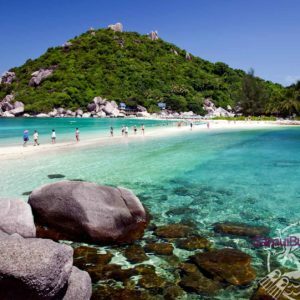 Get from the Koh Samui Airport to the hotel in Choeng-Mon Beach and back will be so easy if you will think about it in advance. Just book Transfer service!